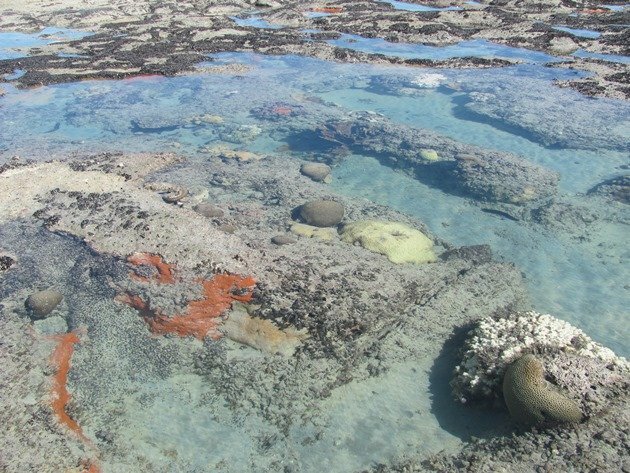 Over the past week in Australia there has been a lot of talk in the media about coral bleaching and most of the conversation has been about the Great Barrier Reef off the eastern coast of Australia. 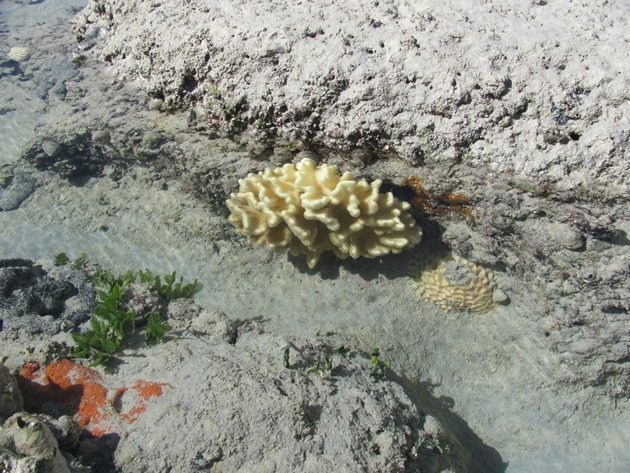 The science currently believes that up to twenty five percent of the coral on the Great Barrier Reef could be lost to bleaching in the next forty years. 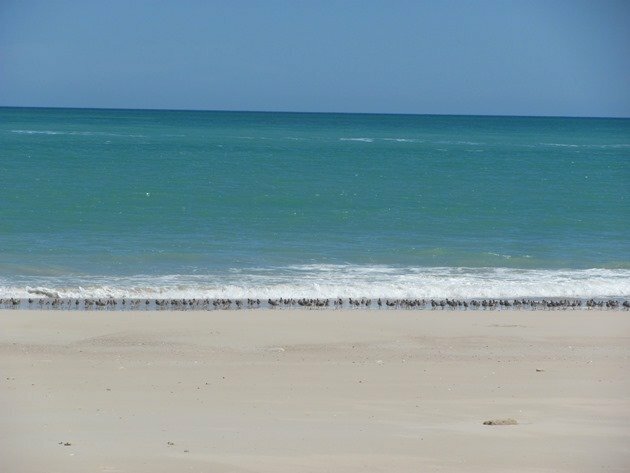 In fact it is not just the eastern coast that is experiencing this phenomenon, but it it also now present along our own coastline here in Broome. 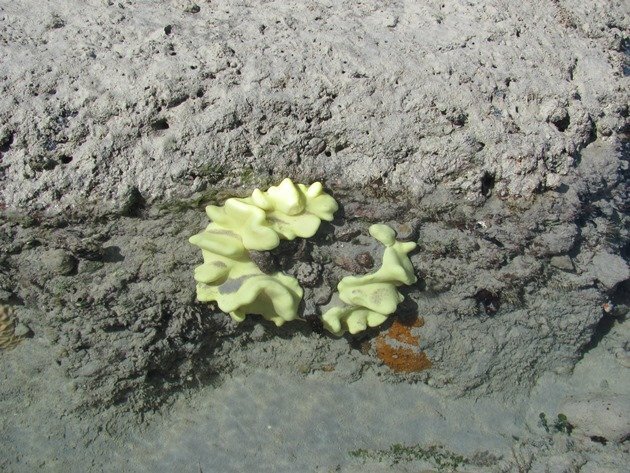 I recently wrote about the shorebirds roosting on Reddell Beach and coral bleaching has now been confirmed along that section of beach at low tide. 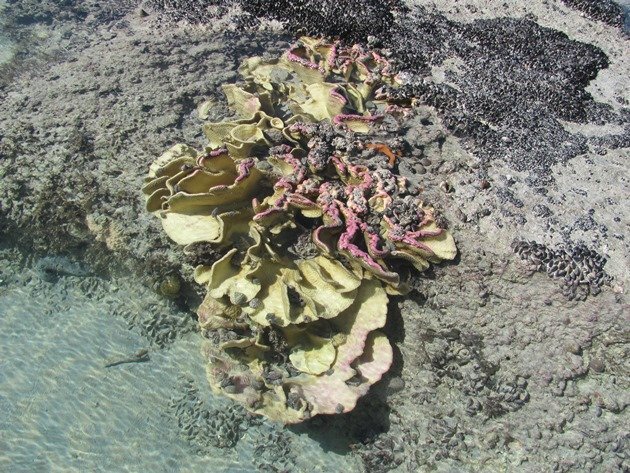 We were very concerned about the state of the reef just off the northern end of Cable Beach and due to the fact that there was a suitable low tide this week we could investigate if this issue also presented itself there. 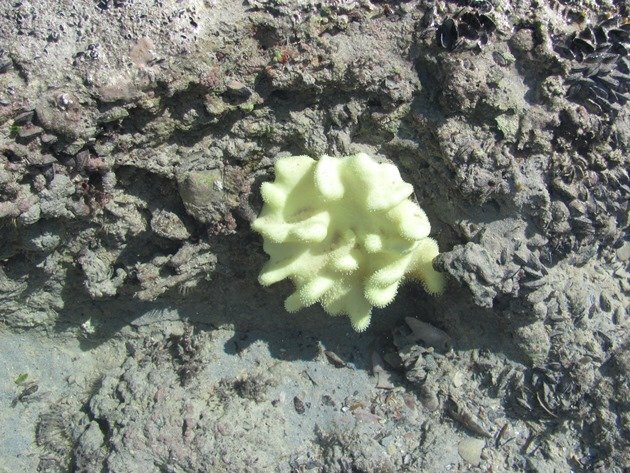 Sadly on arrival at the reef shortly after low tide we immediately observed the bleached coral exposed and we photographed what we observed. There were still birds feeding on the reef as the tide pushed in fast and these were mostly migratory shorebirds and also Reef Egrets. The shorebirds present were mostly Great Knot, Grey-tailed Tattlers, Sanderling, Greater Sand Plovers, Red-necked Stints and Red-capped Plovers. There were only two Bar-tailed Godwits present, but they have mostly departed on their northerly migration now from this area. There were also very few Ruddy Turnstone and Grey Plover present, but they have also headed north. 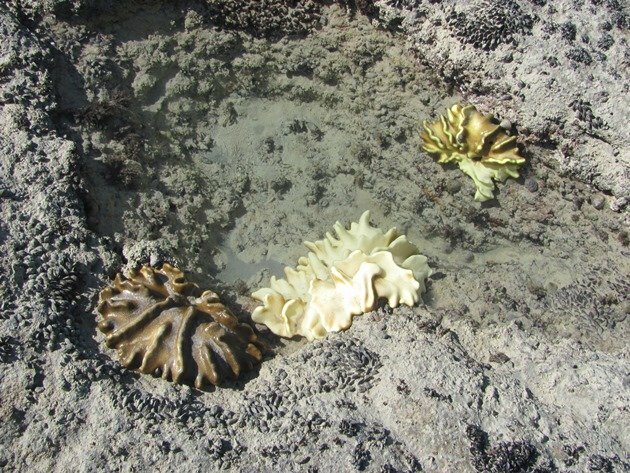 The coral that was bleached was not ugly, but we know it is not in a healthy state at all and is of risk of dying. This would be devastating for the reef and all of its creatures and the future does not look too good at the moment. There have been extreme temperatures over recent months and we have not received the Wet Season rains that we normally associate with the past few months. El Nino has been a major factor in our weather patterns over the past two years and we can only hope that the next few years sees this area receive the average rainfall rather than well below average. 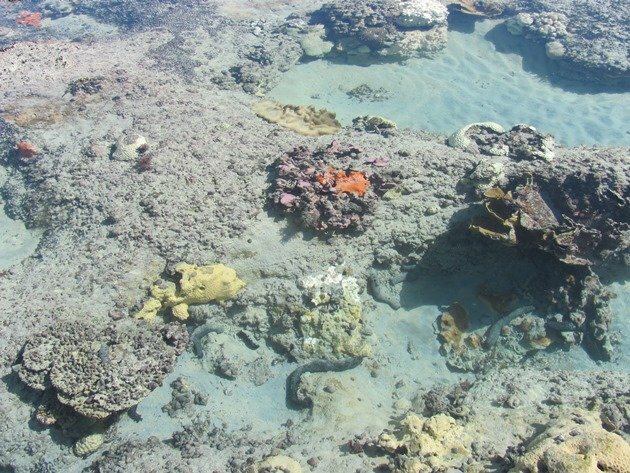 Not all of the coral is completely bleached yet and some pools show coral of varying degrees of bleaching. 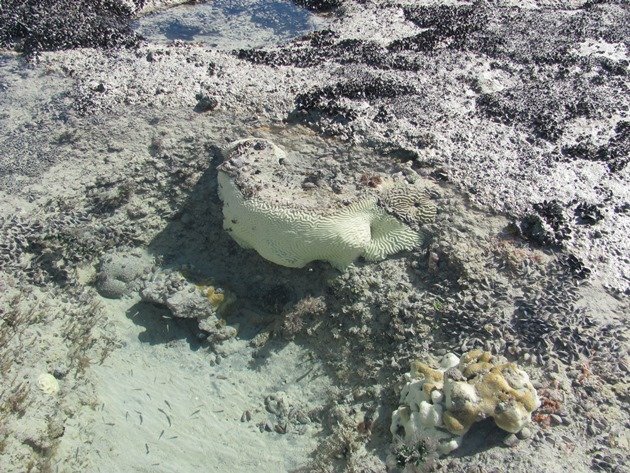 The reef remains colourful and there are still plenty of creatures to observe at this stage, but we will have to continue to monitor the area to see how much the changing environment will affect the life that relies on it for food and shelter. We had to move rather fast to get off the reef due to the tide racing in across the very flat surface and we soon found ourselves in the company of twenty six Sooty Oystercatchers. Of the twenty six Sooty Oystercatchers fourteen were first year birds and would have moved to the mainland with the non-breeding flock during this time of year. 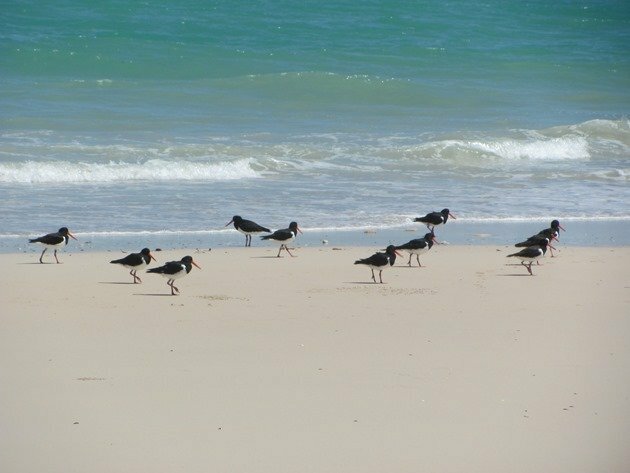 Sooty Oystercatchers breed on offshore islands rather than the mainland in this part of Western Australia. 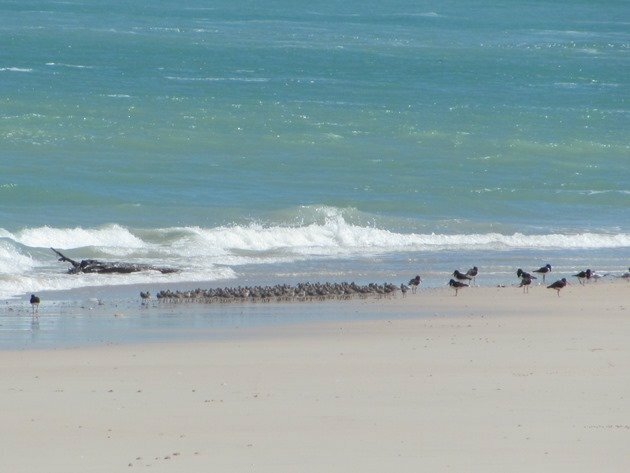 A small flock of Whimbrel gathered further to the north and then reaching the furthest most point near Willie Creek we discovered a large flock of Great Knot that had been forced to the beach when the reef went under water when the tide came in. The Great Knot were in a tight flock until the tide pushed them around too much and then they lined the shoreline between a flock of Pied Oystercatchers and terns. 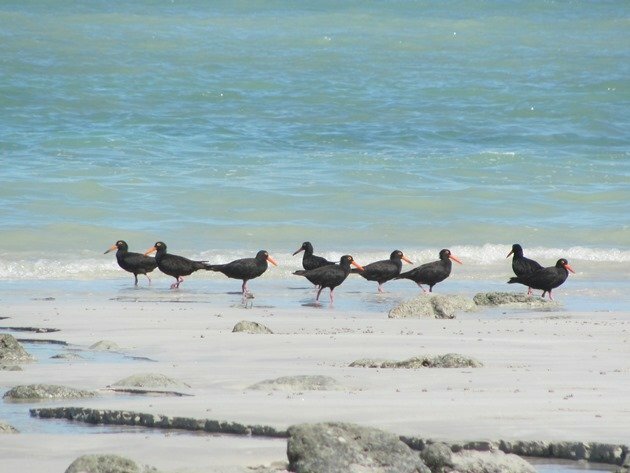 The Pied Oystercatchers in this group are the non-breeding birds and often gather in this area, whilst the pairs of Pied Oystercatchers maintain their territories throughout the length of the reef. 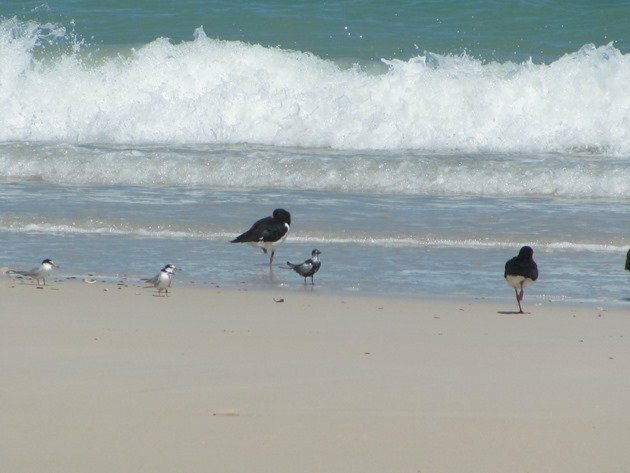 There are more pairs of Pied Oystercatchers in this area than further south and this is most likely due to the close proximity of the reef, which offers the birds an excellent food source. 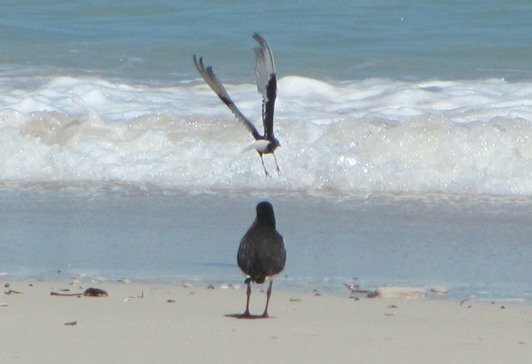 A pleasant surprise on this occasion was the observation of a White-winged Black Tern roosting among the Pied Oystercatcher flock It had started to go into its breeding plumage and was a very mottled grey, black and white. There were also Crested Terns, Lesser Crested Terns, Gull-billed Terns and Little Terns present and they are a lot more flighty than the other birds present, especially with the presence of Lesser Frigatebirds. Silver Gulls are constantly on the lookout for anything of nutritional interest! 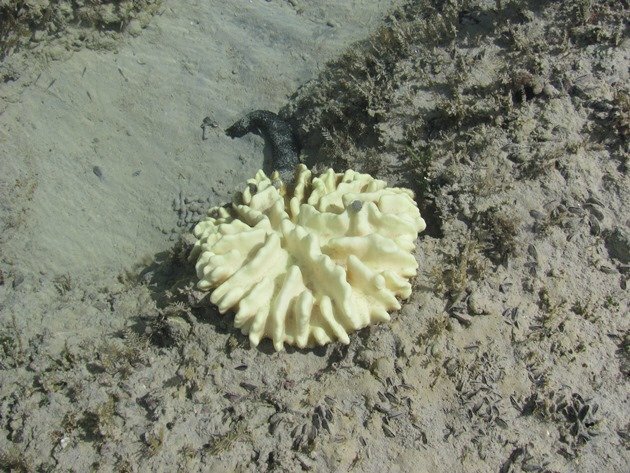 For those of you with an interest in reporting any bleached coral that you may observe anywhere in the world you can send your data to CoralWatch. There is an “app” for that too, for those of you with that sort of technology! 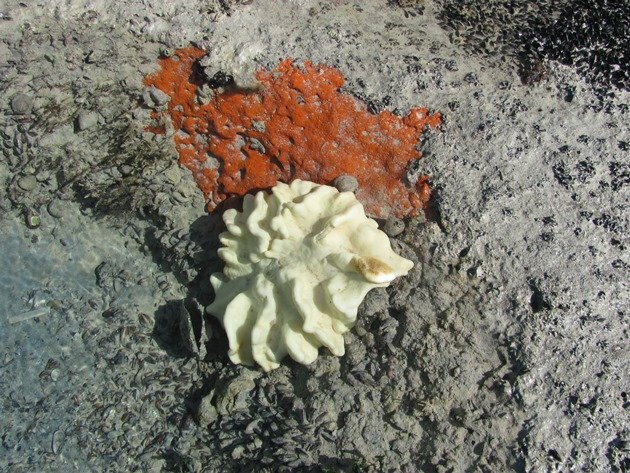 We have sent our photos to the local scientist, so there is an awareness of the problem and how widespread it is. That’s such a tragedy, Clare, to see the many examples of coral bleaching and its implications for the entire reef. Yes, we will keep an eye on it and see what happens over the cooler months and maybe it will survive. We don’t want to lose such a beautiful area along our coast.